For over 20 years Milpower has designed and delivered the most reliable high power amplifiers in support of military applications. We take pride in meeting or exceeding specification requirements on every design with the latest developments in FET technology, cooling, materials, and digital processing. 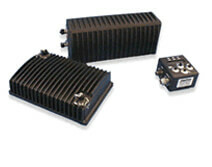 This results in high power amplifiers with the highest MTBF ratings. Our customers directly benefit from these developments reaping the absolute lowest overall life cycle cost for high power amplifiers. Our experience with AM/FM, SINCGARS, HAVEQUICK I/II, SATURN, legacy SATCOM (MIL-STD-188-181, 182 & 183) and the latest MUOS waveforms speaks to our strength in signal processing that depend on these stable and reliable high power amplifiers. We appreciate our installed base of customers and provide supreme customer service along with outstanding quality. We welcome your review of our products and capabilities and look forward to doing business with you soon. Since 2005, Milpower has delivered over 880 VHF/UHF 200W and 100W RF power amplifiers as a part of the Digital Modular Radio communications system aboard US Navy and US Coast Guard ships and submarines. Milpower has delivered approximately 135 VHF/UHF 100W RF power amplifiers interfaced to the Rockwell/Collins ARC-210 series of radios and controlling the RF Products Multi-coupler as a part of the AN/SRC-27, 27A communications system aboard US Navy and Australian Navy ships. In addition, 30 VHF/UHF 200W RF power amplifiers interfaced to the Rockwell/Collins ARC-210 series of radios have been delivered to L-3 for use in ground stations, and as part of the Global Hawk UAS program. Milpower has supplied 250 SATCOM/LOS amplifiers to the USAF Special Operations and Marine Corps for use in transportable secure Command/Control Systems (U.S. Special Operations) and in transportable forward air control systems (USMC).